Easily being the wildest looking motorcycle to roll out of the Borgo factory, the Enduro bears all resemblance to the original 1200 Multistrada but changes its game with more kit and accessories to take on the less-beaten roads too with aplomb. The Enduro Pro here takes that philosophy to a much deeper terrain in a shade of Sand. Out front, the Enduro Pro has the same busy face with the tear drop shaped twin LED headlamps engulfed in a curvy V-shaped front fascia, which also comes with Ducati cornering lights (DCL) as well. The design of the beak-shaped short fender positioned below the headlamps which stretch all the way from the fuel tank and end up in a nose-shaped dual air vent. The screen is lowered to have better visibility during those on-the-pegs off-road riding. The handlebar does get crash guards on both the sides ahead of palm grips and comes with integrated LED turn indicators in them. The switchgear and the comprehensive TFT colour instrument cluster is the same of that of the Enduro, which shows digital readouts for speedometer, tachometer, odometer, trip meters, fuel gauge, temperature gauge, gear indicator, average fuel consumption and selected riding mode. With Ducati Multistrada Link, the rider has an advantage of hooking up his smartphone to have a more engaging ride on his Enduro Pro. The semi fairing of the new Multistrada 1200 Enduro has the same sense of flow in its design, with a smooth curvy design all the way from the rear side body panels to the nose at the front below the headlamps, like that of the standard Multistrada. The partly exposed trellis frame enhances the side profile and lends it the exotic appeal which the Ducatis’ are renowned for. The rear frame, however, gets a black treatment. From the sides, it gets the same big, curvaceous and heightened up fuel tank with large side fuel tank extension panels and black tank pads. It has the tank capacity of 7.9 gal as well, giving it a much bigger tank range in the competition. The Pro makes a wink with the Ducati Performance tubular steel tank bars by Touratech with additional LED lighting to add to the whole appeal. Of course, you get the under body bash plate to beat all those rocks from harming your motorcycle. Then there is that eye-catching Sand-coloured, with rough surface matte finish, front end and tank cover sporting “Enduro” logo stickers on both sides. 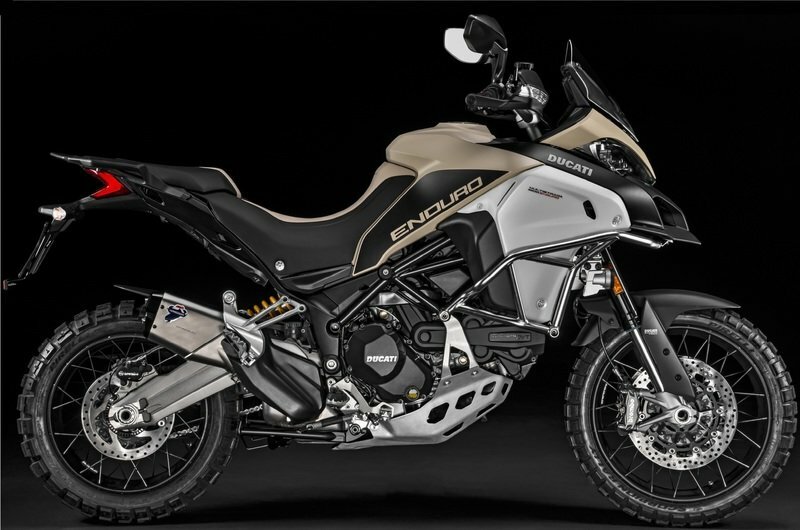 Other Multistrada 1200 Enduro Pro exclusive features include the large and comfortable two-tone seat and the black sub-frame and clutch/alternator covers. Also, sporting is the Scorpion Rally tyres that now come standard with the PRO and the type-approved Ducati Performance titanium silencer by Termignoni. The Enduro Pro here takes that philosophy to a much deeper terrain in a shade of Sand. The new Ducati Multistrada 1200 Enduro has been bestowed with the same Ducati Teststretta DVT engine as found on the standard Multistrada, which ensures an optimised power and torque delivery, thanks to a new Desmodromic continuous variable valve timing. With what we call it as a 90-degree V-twin, the Enduro Pro churns out plenty of torque with 94 lb-ft at 7,500 rpm, and 74 lb-ft comes as early as 3000 rpm. But it really shines in the horsepower department. At 9,500 rpm, a total of 155 ponies gets unleashed from the stable, and you had better be hanging on. All the power is sent to the rear via a hydraulic-assist “slipper” clutch variety designed to limit back-torque and prevent loss of rear-wheel grip during aggressive downshifts. The six-speed transmission and chain drive handle the final drive ratios. The Testastretta uses the Desmodromic valve actuation that operates the intake and exhaust valves mechanically for those precise throttle responses with no springs to be compressed. The Desmodromic Variable Timing (DVT) hydraulically operates camshaft-phasers to manipulate camshaft position that are actuated by solenoid valves. All of this equals to precise camshaft timings and a smooth build-up of power. The Anti-knock sensor allows the rider to use a range of fuel qualities without letting the engine stall in some far-off lands. 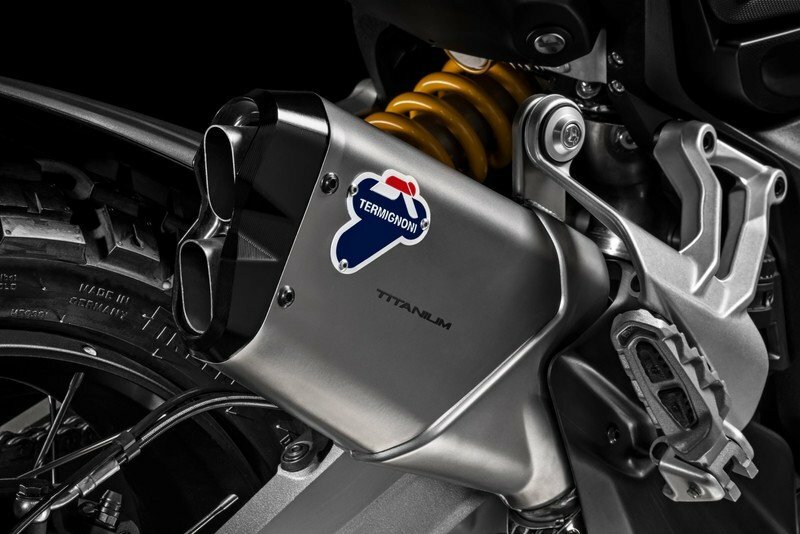 Finally, the single 2-chamber silencer acting as a 2-1-2 collector in the Pro gets a type approved Ducati Performance titanium silencer by Termignoni. 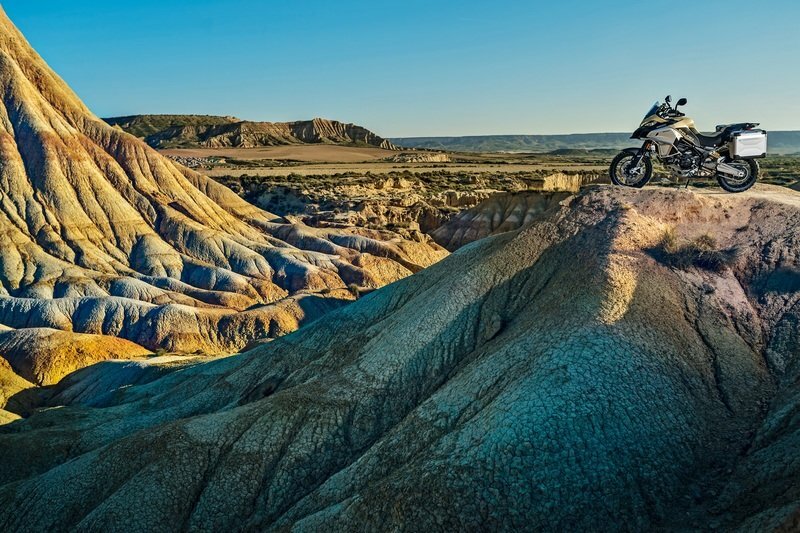 This will elevate your senses wherever you wish to take the Enduro, be it the asphalt or the dirt and rocks. 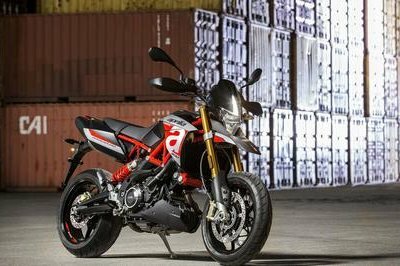 The new Multistrada 1200 Enduro sits on a slightly improved and strengthened trellis frame as compared to the standard Multistrada, with a light weight magnesium sub-frame at the front and a single sided cast aluminium swingarm at the rear. Ensuring optimum off-road capability, the Enduro Pro comes with higher handlebars and seats and most important of all is the height-adjustable levers give the riders an enjoyable ride without having to break a sweat. Ducati runs a set of electronic semi-active Sachs 48 mm forks in the traditional, right-side-up configuration and it comes not only with a longer overall length. 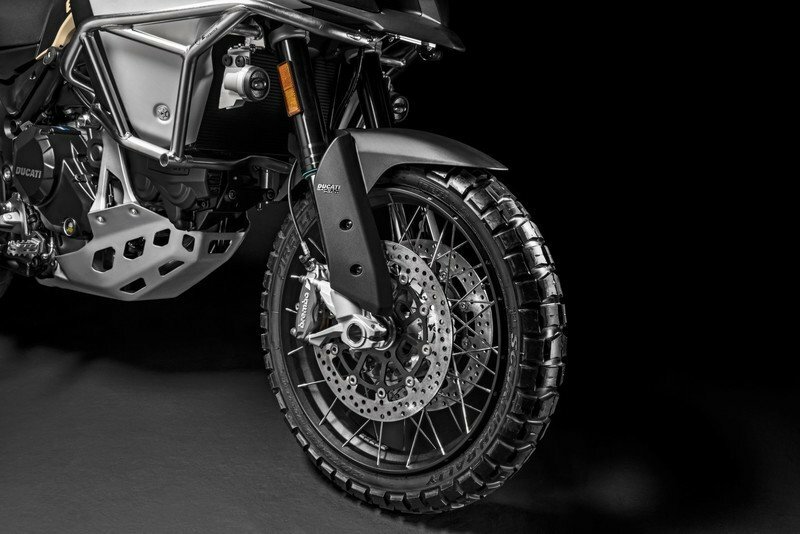 The rear suspension on the Enduro likewise comes with a 7.9-inch stroke from the Sachs monoshock, and both ends benefit from the Ducati Skyhook Suspension (DSS) feature. 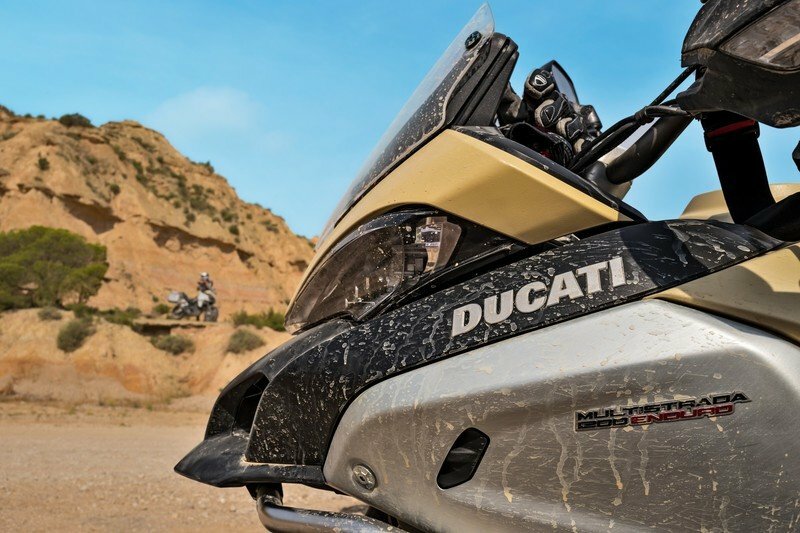 Unlike the other Ducati machines on the sale, the suspension on the Multistrada 1200 Enduro Pro has been finely tuned to tackle all the varying tarmac conditions with equal finesse, while the wheel travel for both the front and rear wheels are more as compared to the standard Multistrada. The ride comes with a 265 mm disc and twin-pot calliper in back, and carry Brembo, four-bore, Monobloc callipers up front with a pair of 320 mm discs. All of the brakes across the board come with cornering ABS as part of the standard package for a little extra traction protection. 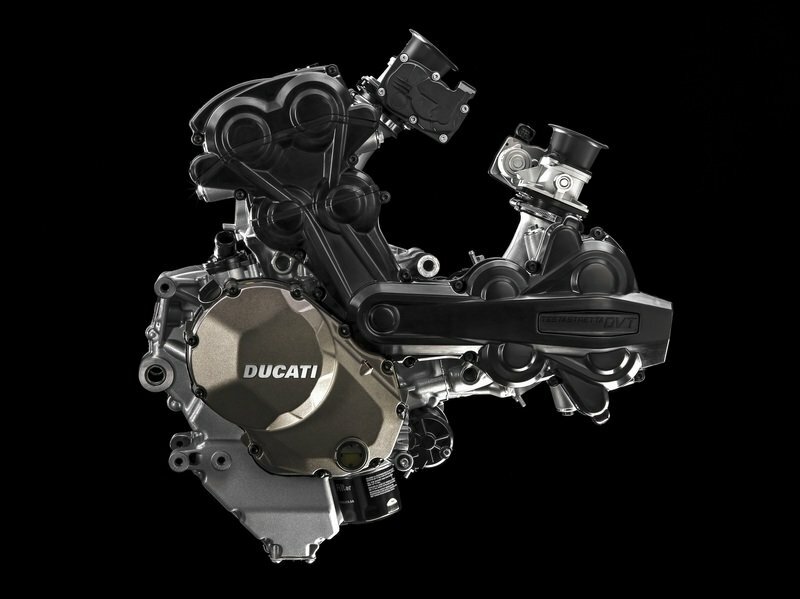 The final bit of magic in the brake system concerns the Ducati Hold Control feature that allows you to temporarily set a brake, as on an incline, and let go of the front brake lever before takeoff. This will pay for itself the first time you have to come to a stop on an incline, especially if you are heavily laden with gear and a passenger. The Enduro Pro comes blessed with a spoked 19-inch front wheel and a 17 inch rear wheel, both of which come wrapped with Pirelli Scorpion Rally tyres that do the job of gliding over broken sections of roads or no-roads sufficiently well. The only glitch for most of the riders, especially the shorter ones, is the high rider seat height of 870mm. The new Multistrada 1200 Enduro also comes with a range of electronics on offer, including the cruise control, hands free ignition, four different riding modes (urban, touring, sport and enduro), power modes and Ducati Safety Pack, which in itself includes Brembo’s state-of-the-art 9.1ME multi-calibration cornering ABS with three mappings and 8-levels Ducati Traction Control (DTC) and Ducati Wheelie Control (DWC). 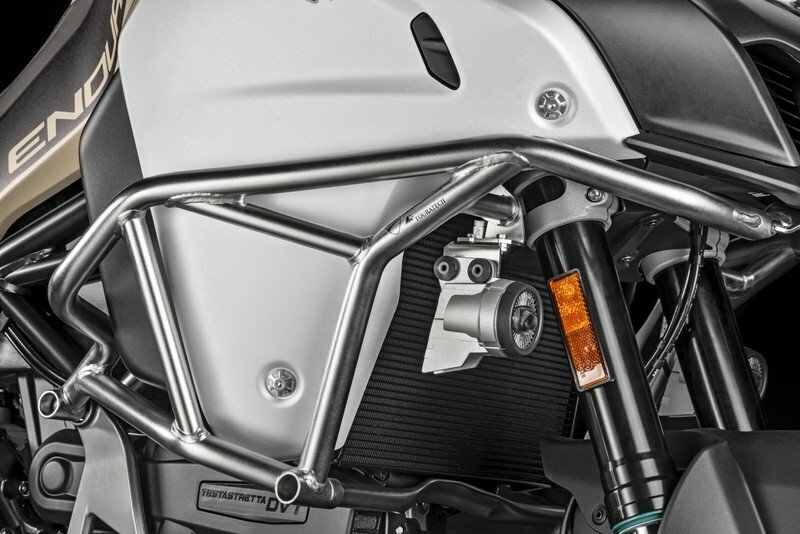 The final bit of magic in the brake system concerns the Ducati Hold Control feature that allows you to temporarily set a brake, as on an incline, and let go of the front brake lever before takeoff. 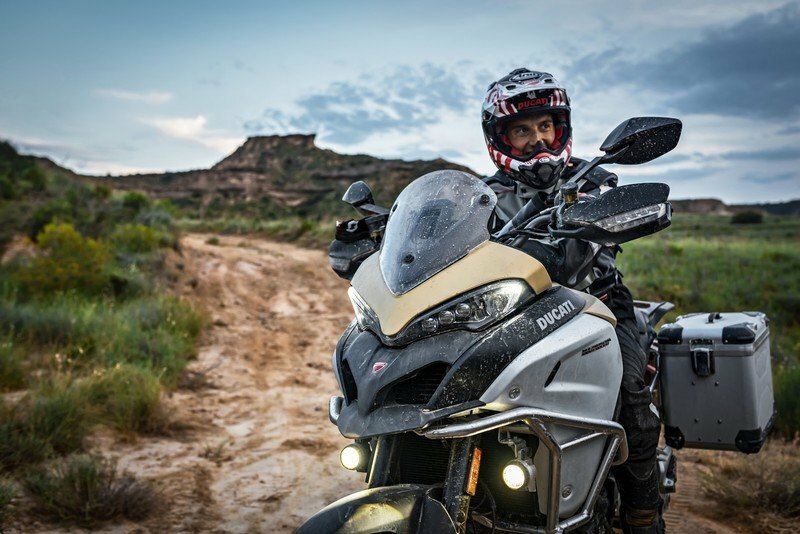 MSRP for the Ducati Multistrada Enduro fell at $21,295. Ducati says we can expect to start seeing the Enduro Pro in dealerships sometime in August, and the U.S. retail price is TBD. We expect the Pro version to definitely have at least $1500 jump on its price tag from the original Enduro. Expect the Pro in only the eye-catching Sand-coloured, with rough surface finish, front end and tank cover sporting “Enduro” logo stickers on both sides. On the Multistrada 1200 Enduro Pro, the Oil Service and Desmo Service are now carried out every 9,000 & 18,000 miles respectively. There is no competition to this Italian in terms of defining beauty. But when it comes to riding and built quality, there is no escaping the comparisons from the European brothers. Talk about BMW or Triumph, they have been running the show for quite some time now and have produced the world’s finest. 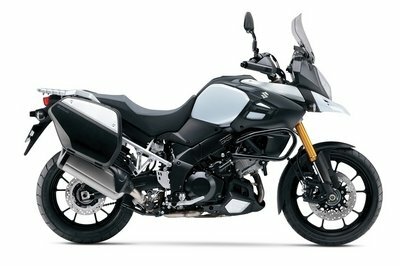 To give the Multistrada something to quirk about, the BMW R 1200 GS Adventure and the Triumph Tiger Explorer XC surfaces on the face of the Ducati. 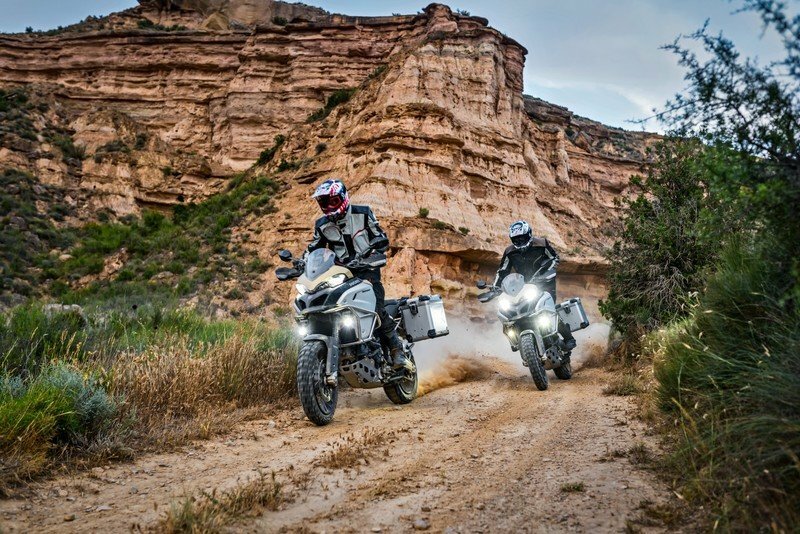 The flagship motorcycle of the GS series, R 1200 GS Adventure, is regarded as one of the most capable and technically advanced adventure motorcycle across the world today. The motorcycle, in its latest avatar, is here showcasing the best of engineering prowess in the segment of enduring motorcycles, and at the same time, it takes forward the legacy of the almost 35-year-old ‘GS’ nameplate, which initiated with the R 80 GS back in 1980. 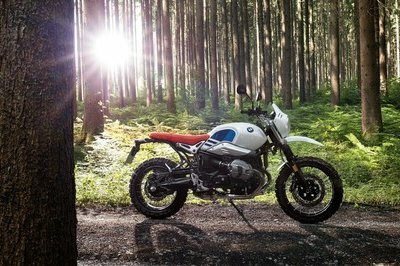 The motorcycle is positioned above the standard R 1200 GS as a more kitted out and beefed up motorcycle, ready to conquer even more difficult terrains. 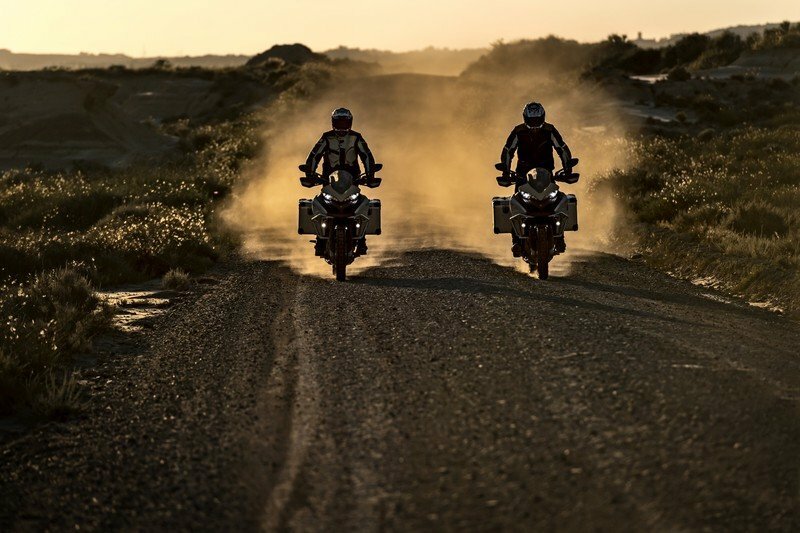 The BMW R 1200 GS Adventure comes with the company’s trademark philosophy of equipping the motorcycles with asymmetric headlamps. Though this time, the headlight unit comes fitted with LED daytime running lamps, which makes it very special and distinctive. The adjustable front windscreen is also larger than the one on the R 1200 GS. The fuel tank also gets heavy black claddings towards the front, with the frontal portion of the tank getting tubular frame protection, all the way towards the engine downwards. 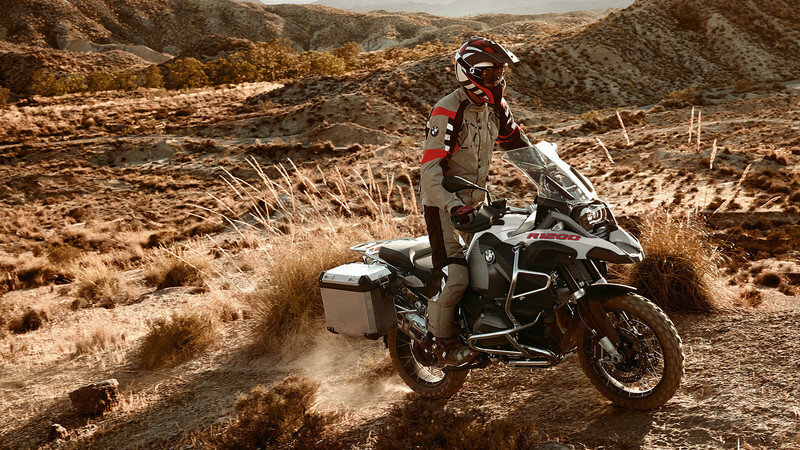 The BMW R 1200 GS Adventure comes fitted with a four stroke, air/liquid cooled, flat twin, 1170cc engine, which is shared with the standard R 1200 GS and pumps out 125 bhp of power and 92 lb-ft of torque. Mated to a six-speed gearbox which transfers the power produced to the rear wheel via a shaft drive, the engine has a solid bottom end grunt and mid-range punch, and is very smooth running and high revving in nature. The combination of air as well as liquid cooling enables the engine to be efficient and reliable without sacrificing on high pulling power. The bettered out Paralever 37mm front hydraulic forks, and cast aluminium single sided swing arm with Telelever have made the steering of the motorcycle even more accurate than before, resulting in a sharper handling and better weight balance. To add in, the optional Dynamic ESA which BMW provides for this bike enables the suspension setup to behave as per the amount of load and type of terrain the bike is going to tackle. As mentioned above, the four different riding modes can be retrieved just at the press of a button on the switchgear. The bike also comes with a Shift Assistant Pro, which allows you to change the gears without using the clutch and throttle levers. The bike comes with dual 305mm disc brakes at front and a single 276mm disc brake at the rear, coupled up with the ABS. 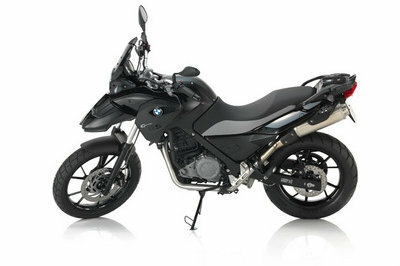 MSRP on the R 1200 GS Adventure starts at $18,895 for Light White. Add another $100 for Ocean Blue Metallic Matte or Racing Red Matte. Add the Premium options package for another $3,350. 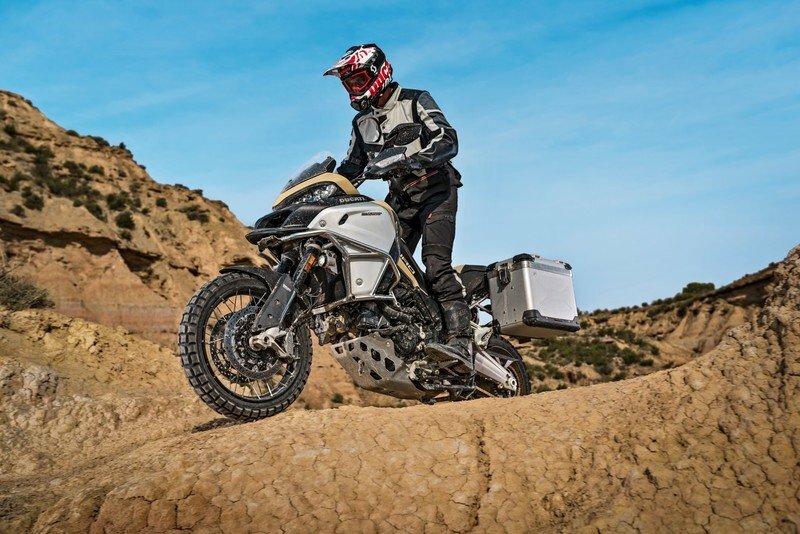 Based on the Tiger Explorer XC, the Tiger Explorer XCa hasn’t missed out on the perfect stance of a true adventure motorcycle as former and looked like an evolution of the smaller Tiger 800 XCa. This flagship Tiger gets a host of additional kit and changes over tall other models to make it the most hard-core adventure utility motorcycle of them all. The Tiger Explorer XCa has got the twin round headlamp setup surrounded by plastic cladding from the regular Tiger Explorer XC. The headlight also comes with a small beak like fender below it, which gives it an added touch of adventure motorcycle, as well as two LED auxiliary fog lights. To increase the protection from the outbursts of rough terrains, Triumph has provided protection bars besides the engine as well as an aluminium sump guard below the engine. The other equipment which comes standard in the motorcycle include a center stand, two 12V power sockets, cruise control, heated grips, stainless radiator guard, Hill hold control system, two extra riding modes – the Dynamic Sport and the fully customizable Ride, heated rider and passenger seats, Tyre Pressure Monitoring System and CNC Machined foot rests. Overall build quality is exceptionally well, as expected from a Triumph motorcycle. 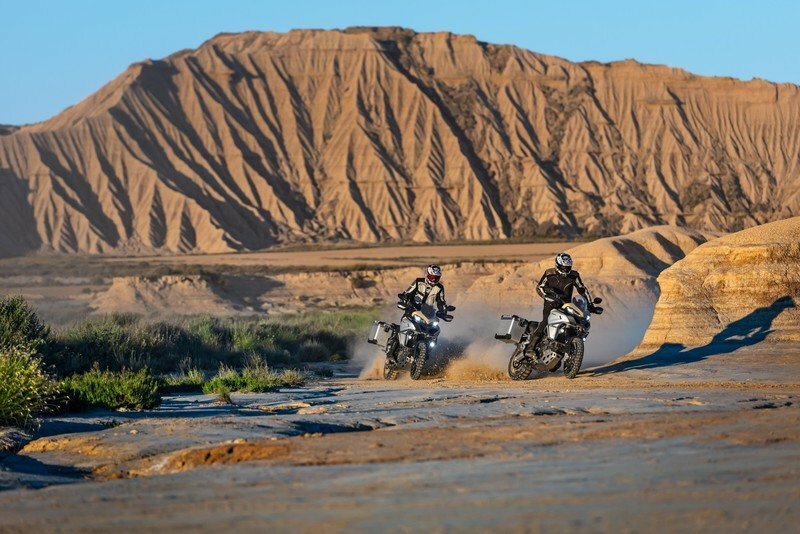 The new Triumph Tiger Explorer XCa retains the very capable four stroke, liquid cooled, inline three cylinders, 12-valve, 1215cc engine from the previous generation Tiger Explorer, which is currently the biggest engine on any adventure motorcycle all over the world. Mated to a 6-speed gearbox, this 1215cc engine can churn out a maximum power output of 135 bhp and a peak torque output of 105 lb-ft. Like most of the adventure motorcycles, the drive is transferred to the rear wheel via a shaft. The bike comes with 46mm upside down telescopic forks at the front and monoshock with remote oil reservoir at the rear, both of which are sourced from WP, unlike the Kayaba forks on the previous iteration, and have a suspension travel of almost 190mm, making this suspension combination best for whatever the worse condition of riding you throw at it. 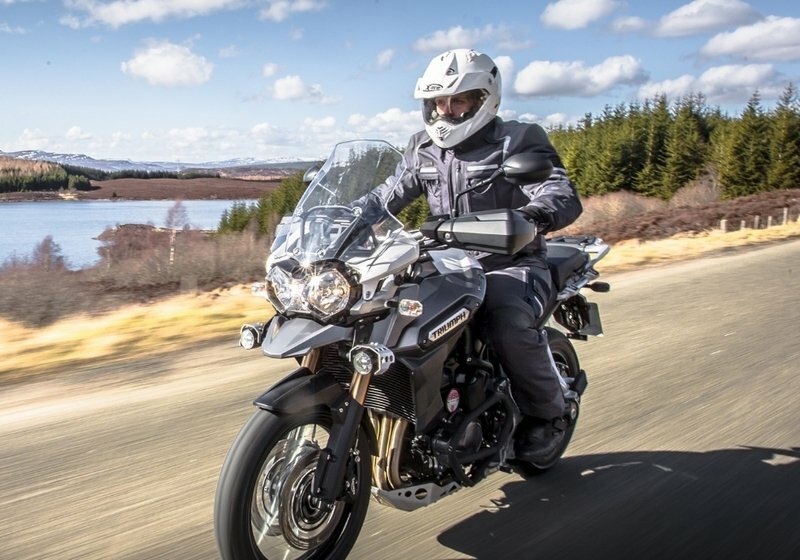 The new Triumph Tiger Explorer XCa comes with a braking setup of dual 310mm discs at the front and a single 285mm disc at the rear, sourced from Nissin – same as that on the Tiger Explorer XC. Both theses brakes are coupled to a switchable ABS. Apart from the ABS, the motorcycle also comes with traction control which has varying riding modes. MSRP on the Tiger 800 XCa is $20700. Your colour choices are Crystal White, Matt Khaki Green and Lucerne Blue. Triumph cover your XC with a two-year unlimited mileage warranty and a 12-month unlimited mileage warranty on replacement parts. For some people, adventure is about finding your way through the unknown and doing things most have not or seeing things never seen before is a savour best felt. But unless you plan on walking, you need a way to get there. This is where this 1200 Multistrada Enduro Pro comes in and leaves you with nothing less than a surprise on how capable this thing really is. Though Ducati is known for making some really pricey motorcycles in the past, in recent times, however, the models of Multistrada range have shown that Ducati can offer sheer value for money options as well. The Enduro Pro does, however, fall on the expensive side but no one can argue about the list of pizzazz and attraction the Ducati flaunts. It still has got the same silhouette, shape and design as its elder siblings, thus scoring full marks in terms of design. 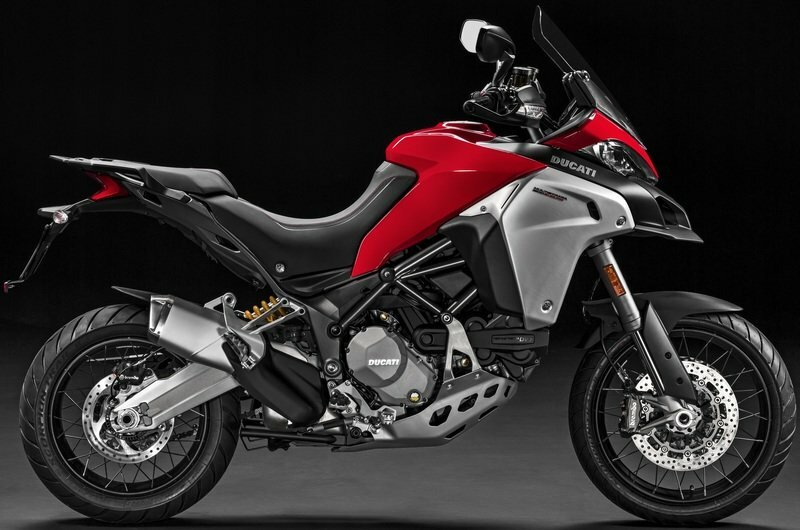 “The Multistrada 1200 Enduro goes even more globetrotter with the new Pro version. “ That is how Ducati puts it. The tank cage, titanium exhaust units, rally tyres, spokes give the rider a higher reach to get off-road and get exploring. With these changes, the new Multistrada 1200 Enduro PRO definitely stays true to its claims of being the wildest Ducati to go on sale. It perches on the highest point available for motorcycles to tread on in terms of chassis design, riding dynamics and handling capabilities on roads that have been unexplored and thatched. Knowing this is the best tool for you to get going places, it’s not a question of how far your Ducati will go. It’s how far you’re willing to take it. It perches on the highest point available for motorcycles to tread on in terms of chassis design, riding dynamics and handling capabilities on roads that have been unexplored and thatched. 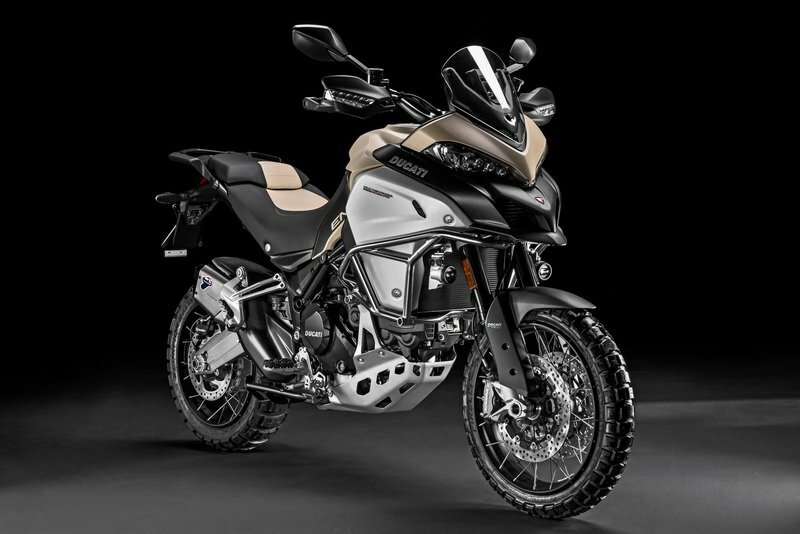 The Multistrada 1200 Enduro goes even more globetrotter with the Pro version. Cutting-edge performance and active safety thanks to the twin-cylinder Testastretta DVT engine and Riding Modes with ABS Cornering, DTC, DWC, DSS and VHC. Borgo Panigale, Bologna (Italy), 20 June 2017 - The Multistrada 1200 Enduro goes even more globetrotter with the new Pro version. The trailblazing spirit of the most venturesome Multistrada now reaches new heights thanks to this latest version, designed for riders eager to get off-road and get exploring.